Major changes can be done in messaging through Facebook application. 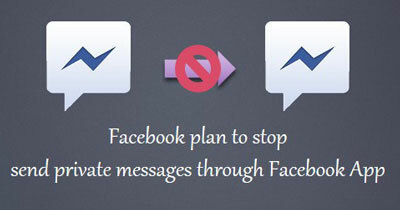 FB users who send private messages through Facebook have to install new application to send their private messages. This news is released by Facebook itself. Biggest social networking site has started trial of this new service in France, England and many other European countries. In this new service selected users have to download to send private message through Facebook. Although nothing is said that when this service will start in all over world. After reading this article you know how any registered Facebook users install new app to send private message via smartphone. Daric Mans in behalf of Facebook told that in future everyone have to use this application for messaging. He said that this new app started for better service and experience for fb users. This Standalone messenger app can be download free and it is faster way of chatting than past one. By this app users can also use the service of Facebook free calling. Now days Facebook is facing a tough competition with Messaging app, Snap chat and Line which are becoming famous very fast in users. Recently Facebook gave surprise to all by buying very famous messaging app whatsApp. Fb stop his main Smartphone service from which all users easily get or send private messages. Now they need to install a latest messenger app on your phone to send and receive messages in different countries due to the main reason to defeat the main competitor like Snapchat and Line. No doubt that Fb is world top most and number one social networking service at this time which have approx. 1.2 billion users. Fb already have Instagram, it is a photo-sharing app from which you can easily share your photos with your friends and collogues.